China has found its new blockbuster action star with Wu Jing (吴京). The 43-year-old’s latest film Wolf Warrior 2 <战狼2>, sequel to the 2015 film of the same name, has grossed over 900 million RMB four days after its release, and 2.2 billion RMB after eight days, outgrossing even the best-selling Hollywood films. Wolf Warrior 2 stars Wu Jing as Leng Feng, a Chines soldier who was sentenced to prison after taking down the boss in charge of his town’s destruction. After his release, he travels to Africa, where he comes across a band of ruthless mercenaries. Celina Jade (盧靖姍) and Frank Grillo also star. To ease into his role, Wu Jing spent 18 months training as a soldier. “If I’m not a soldier, then how can I become one?” he said. With the popularity of Hollywood movies, Chinese heroes like Wu Jing’s Leng Feng have become rare. “China’s silver screen needs to have their own hero like Leng Feng,” said Wu Jing. “A man who is noble and a leader in every sense of the way.” The film is a refreshing return to traditional Chinese heroism after the long trip with American superhero movies that have become the global trend in recent years. Wolf Warrior 2 has found success not only in its homeland China, but also abroad in Malaysia and Australia, with netizens posting online about having to watch the movies in a full-house theater. 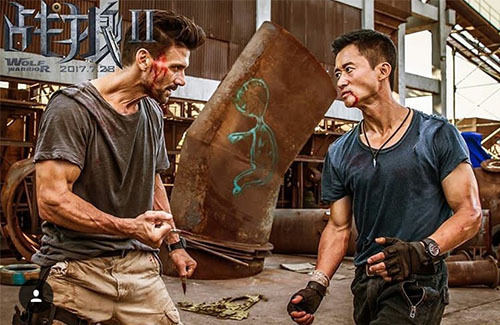 This won’t be the last of Wolf Warrior—though not officially announced, a post-credit scene in the movie implies that Leng Feng will return to the big screen with a new adventure.